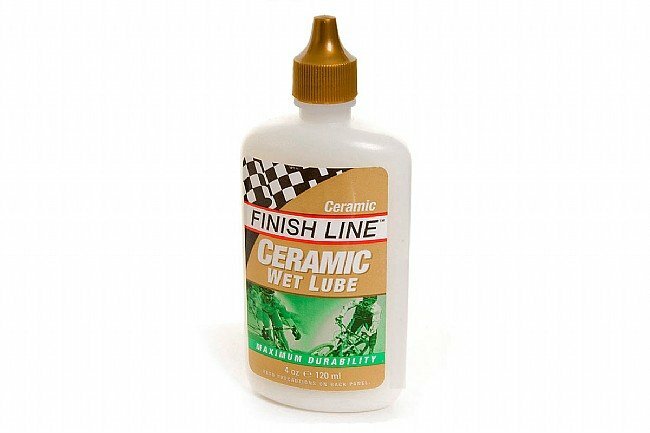 Finish Line Ceramic Wet lube combines with tiny boron nitride platelets and fluoropolymer for incredible smoothness and durability. It builds up a tough coating on the chain that reduces energy robbing friction. Waterproof to stand up to the sloppiest of days. 4 oz bottle. I used this product in the past and came back. Here in S. Florida, we get a lot of rain between May and October. No issues with washout of the product I apply a couple of times a week even after getting caught in a storm or two a week. Lots of sand on our streets as well. Sticky lubes hold the sand and wear out chains. This product doesn't pick up and hold that grit. This lube is very long lasting. I use it on my MTB and the bike that sees the most rain on the road. It does turn black and can be a little messy early on but a quick wipe between lubes and it works like a charm. Perfect for wet weather and dirty conditions. If you are obsessed with a silvery clean chain, you won't like it. If you like a quiet chain and aren't prone to constant lubing, you will. I really have though this is one of the better chain lubes. Does not attract too much road grim and seems to stay in place even after a light rain. best, longest lasting chain lube i've used to date. regular chain lube. also used for lubing brake moving parts.